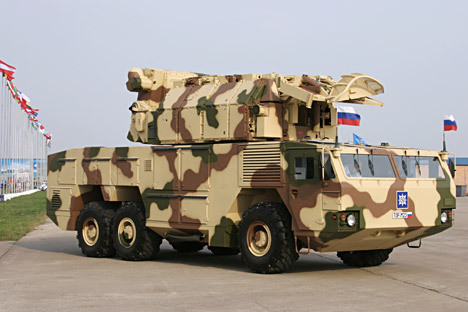 The two SAM anti-aircraft missile systems are used for short-range air defence. They can also be used during advances, to cover tank groups. Full-scale specimens of the surface-to-air missiles (SAM) were shown to the general public during the international phase of the Tank Biathlon 2014, which started this week, simultaneously with Innovation Day of the Russian Defence Ministry. SAMs Tor and Osa – are anti-aircraft missile systems for short-range air defence, created for different objects. In addition, they can be used during advances, to cover tank groups. The Innovation Day of the Russian Ministry of Defence is a special event for professional audiences, which is conducted to demonstrate promising ideas and developments of Russian industry by executives and specialists of the Ministry of Defense and the Armed Forces of Russia. These complexes were originally developed as a major tool to combat against massive air strikes on a battlefield. Tor and Osa stand at the last line of defence, i.e., they neutralize the enemy’s weapons as they approach the target, acting in parallel with the short-range air defence missile systems, such as the Tunguska or Pantsir, acting as a means of direct cover. Osa and Tor for many decades have been in the service not only of the Russian but also foreign armed forces, and have been used many times in armed conflicts around the world. These systems are not obsolete, as their AAMS (Anti Air Missile Systems) are constantly upgraded and improved. Thus, a new modification of Osa – the Osa-AKM has been equipped with new electronics, providing it with modern means of identification and satellite navigation. The Osa-AKM can now effective fight against any kind of ‘smart’ air weapons from drones to precision missiles. Thanks to an upgrade, the Tor-M2E SAM system, in on go, can strike down four air targets with four anti-aircraft guided missiles with ranges of up to 15 km. Like the previous generation of the short-range complexes, the Tor-M2 SAM is intended to effectively combat and defeat aircraft missiles of the “air-land” class and controlled and guided air bombs, anti-radar missiles, aircraft of tactical and army aviation, cruise missiles, helicopters, and unmanned aerial vehicles. According to military expert Igor Korotchenko, the Tor has a number of significant advantages, in comparison with similar systems made in other countries. One of these advantages is the minimum response time of the complex, its deployment (3 minutes) and its high mobility – after firing, the system can quickly change its location, thus avoiding enemy fire, and the crew of Tor remains unscathed. Thus, escaping from a possible attack of the opponent, due to the high mobility, minimizes the risks for the crew and for the product itself. Moreover, the Tor is easy to integrate into existing air defence systems, while retaining the possibility of autonomous use, Korotchenko believes. Tor-M1 and Osa are also in service with Egypt, India, Syria, Ecuador, Cuba, Jordan, Venezuela, and China. The effectiveness of Tor and Osa is demonstrated by the fact that these systems are used also in a NATO country – Greece. As of August 1, the EU has implemented sanctions against Russia in the area of military-technical cooperation. This arms embargo means the actual clotting of military-technical cooperation between Russia and the EU, including in Greece, where products are supplied by the Kupol Electromechanical Plant in Izhevsk (part of the PVO Almaz-Antey Concern, which produces air defence systems). Nevertheless, these short-range SAM’s have good export prospects in the countries of Southeast Asia. According to the editor of the trade magazine Vestnik PVO, Said Aminov, the Tor system may be purchased by Indonesia. “The acquisition of such military means could improve both military and political stability in a country located in quite an active region of Southeast Asia,” says Aminov.